In Part 1 of this series Mateo Barnstone discussed how row houses can help with affordability and why they might make a great deal of sense given growth pressures Austin is facing. Today he’ll dig deeper into how the land development code limits the availability of this housing type. Dan’s post does a pretty great job of laying out the basic problem in Austin. SF-3 zoning is essentially a suburban code. The problem is that suburban code is the widely applied default zoning of our urban core. As you can see – the overwhelming predominant zoning in Austin is Single Family (SF). And the most common SF zoning is SF-3. With a minimum lot width of 50 ft, large lot sizes and mandated sideyards we can quickly see why we don’t have a lot of row houses in Austin – they’re largely prohibited by code. On top of that, there are parking requirements, various overlays including neighborhood plans and a whole additional layer of restrictions under the McMansion Ordinance which further regulates and limits development by establishing additional maximum development requirements, front and rear setbacks, setback planes (the so-called tents that create additional sloping setbacks), side wall articulations and other compatibility standards. So even if one were able to get the variances needed to construct a row house development they would, in most cases, be barred under the McMansion Ordinance. So – where can you build row houses in Austin? The answer is not very many places. You could do so on downtown lots zoned CBD or DMU but market forces would make this highly unlikely to occur in all but extremely limited circumstances. SF-4B does not appear to have a maximum number of units and no side yard setback requirement so it might be theoretically possible. However, in discussing row houses and zoning with David Whitworth, he said that he’s never actually seen a SF-4B lot. * Row houses are also theoretically possible under neighborhood Mixed Use zoning. If you’re looking for where those might be – look very hard. They’re the light brown lots on the zoning map above. There are two other zoning districts where row houses are possible: There is Traditional Neighborhood District (TND) and Transit Oriented Development (TOD). I’m not aware of any subdivision that has taken advantage of TND yet (if any reader is, please let us know in the comments). The TOD is limited to a handful of locations scattered about town. The furthest along appears to be Crestview which does have a few blocks of row houses. 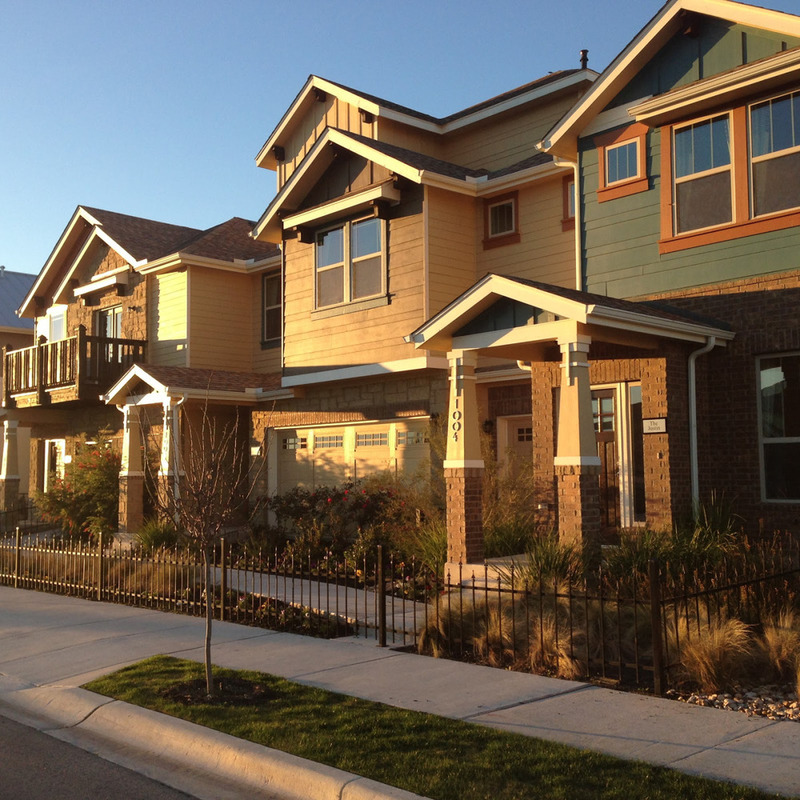 The vast majority of row houses being built today in Central Austin are in Mueller. As a PUD, Mueller has special land use regulations and is specifically exempted from the McMansion Ordinance. You can see how radical a change would be needed in our code to allow for these structures in our center city neighborhoods. Including row homes in TODs and PUDs is a fine idea and they are indeed building a lot of them in Mueller. But these kinds of opportunities are few and far between. We can’t fix all of Austin’s affordability problems with PUDs like Mueller. As large a development as Mueller is, it’s only roughly a square mile and represents less than 1/2 of 1% of the land in the City of Austin. As a comparison, Austin has about 10 times that amount zoned for mobile homes. What we can do is look to places like Crestview and Mueller as proof-of-concept. We know that row houses can be built in a way that allows for plenty of light, does not feel over crowded and can be done in a variety of pleasing architectural styles. Those places show that Missing Middle housing can blend in perfectly well with other housing types, including single family detached homes, and that the neighborhoods that allow for them will remain desirable, pleasant and lovable places. One final thought – and it’s ridiculous to even have to make this point but shrill voices from those fearful of change force having to put these disclaimers – merely allowing for these structures to be built will not mean the automatic scraping of Austin’s central neighborhoods. A developer has to find a contiguous plot of land or assemble enough parcels together to develop a block of row houses. And the project has to be financeable, constructable and marketable – that’s not going to happen that much in central Austin. There’s a limited market for this product. Row homes are a great option for my family and I think that as people become more familiar with the advantages of row houses that many will be attracted to the cost savings and other advantages – but I recognize they’re not for everyone (just as single family detached homes are a great product for some, but not for everyone). If we permit enough variety of housing types then the market will determine what the right mix is over time and residents will have an abundance of of options to choose from. Change is hard and requires careful thought. But Austin is under tremendous growth pressure. Our land development code makes many of the tools for attractive urban growth illegal and as a direct result forces sprawl. As David Whitworth pointed out to me, the City imposed SF-3 housing at a time when sprawl made a certain amount of sense: land was cheap, distances were short (made even shorter by the automobile), and traffic was light. I think everyone can agree that none of those conditions exist today. My question is this: why are we clinging to a suburban code in our urban core? Is there a tangible reason, other than fear of change, that makes the row house worth making illegal to develop in the urban core where density makes the most sense and as a direct result force more sprawl on the periphery with all of its concomitant ills? TL;DR – The City of Austin is engaged in the CodeNEXT re-write of our Land Development Code to align our land use regulations with Imagine Austin’s priority program 8 which calls for regulations that promote a compact and connected city. The row house is among the housing types that can help the city achieve the goals of Imagine Austin, can be built at a substantial discount to single family detached homes and thereby help address Austin’s affordability problems, efficiently utilizes available land, contributes to walkable communities and can help build a resilient tax base while still preserving high quality residential neighborhoods. * The minimum site requirements for townhouses permitted in SF5 and SF6, the “Townhouse & Condominium Residence” codes, appears too large to build affordable row houses and seems to contemplate more of a detached city home. **Actual lot widths offered at ~22.5ft appear to be a bit wider than minimum permitted under the PUD. The Mueller Design Book shows lot dimensions of 90 x 22.5 and 70 x 22.5. There are also 55 x 35 lots for live-work “shop homes”. See section 2.3. This post was originally published on Austin On Your Feet.